After three consecutive sellouts, Monster Energy Fort Rock is expanding to two days– Saturday, April 30 and Sunday, May 1, 2016–at JetBlue Park in Fort Myers, Florida. 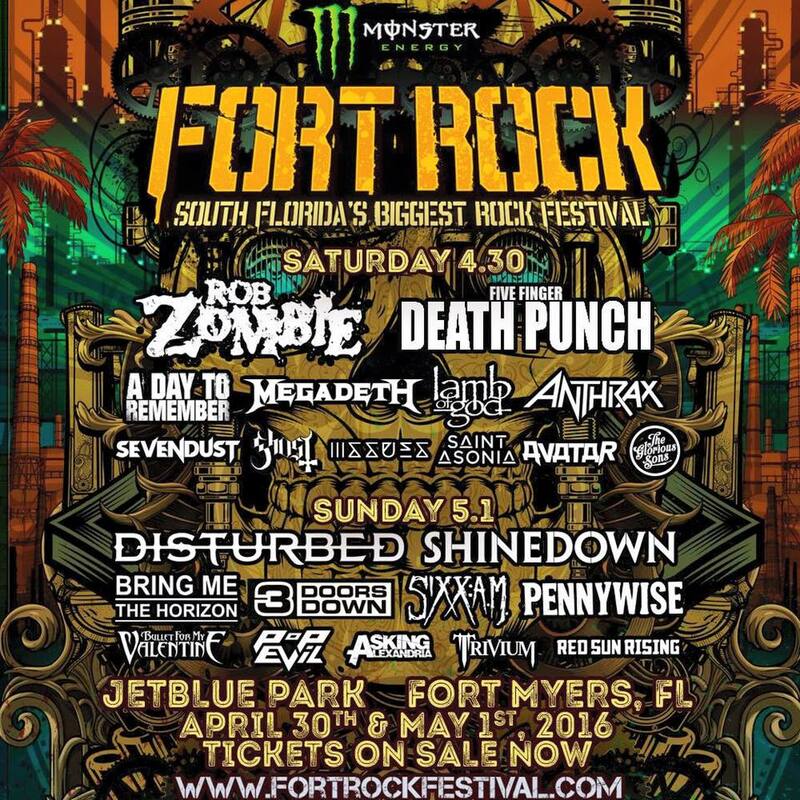 South Florida’s Biggest Rock Festival will feature performances fromrock icon/filmmaker Rob Zombie, the return of Disturbed (after a 4-year hiatus),Shinedown, Five Finger Death Punch, A Day To Remember, Bring Me The Horizon, Megadeth, 3 Doors Down, Sixx:A.M., Lamb Of God, and more. Visit www.FortRockFestival.com for the most current information on the festival. Early Bird tickets for Monster Energy Fort Rock are available now until Sunday, December 20. For the first time, tickets are also available for purchase via layaway this year. A limited quantity of Weekend GA tickets will be available for $79.50. Once those are sold out, Early Bird GA Weekend passes will be $89.50 through 11:59 PM on Sunday, December 20. VIP Weekend tickets will also be available starting at $199.50. Once that allotment sells out, regular VIP Weekend tickets will continue to be sold at $224.50 during the Early Bird period. A limited number of Weekend TeamRock+ VIP Ticket 2-Packs ($499.99) and Early Bird Ticket 4-Packs ($299.00) will also be available for purchase during the Early Bird period.